All Aboard for the First Night Train – Our 31st on the 31st! Northampton, MA—On Thursday, December 31st, the public is invited to a 12-hour, family-friendly festival of the arts presented by the Northampton Center for the Arts and PeoplesBank. 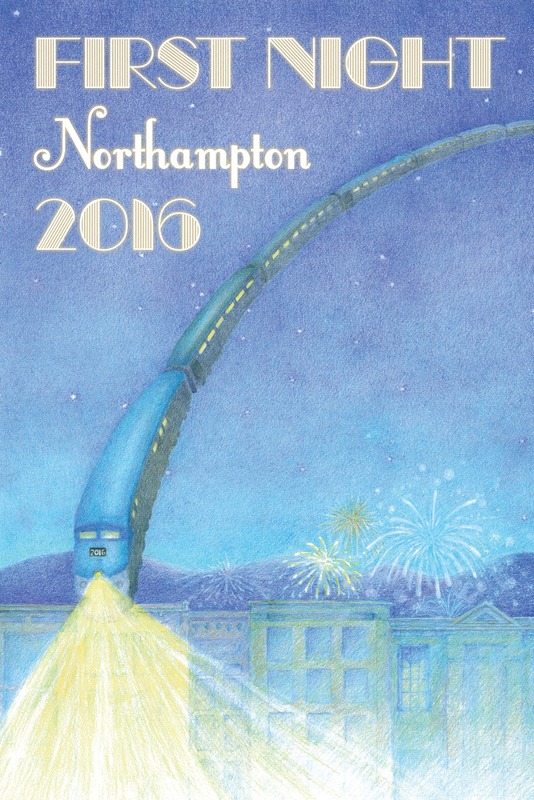 For the 31st time, Northampton hosts its signature New Year’s Eve event, boasting an eclectic array of entertainment at 21 terrific downtown venues. The customary noon kick-off at the Academy of Music stars the First Night Circus Train engineered by the amazing performers of SHOW Circus Studio. Up at Theatre 14, the players of Paintbox present the adventures of a cool kitty in a special 1 pm showing of “Puss In Boots.” The excitement continues at a first-ever First Night double feature with the A2Z Yo-Yo Team and Mad Science of Western New England in the 2-4 pm slot at John M. Greene Hall. The afternoon performance program is filled with options for all ages: puppetry, dance, a cappella voice, classical and contemporary music from solo to quintet, acoustic to electric, even a full guitar orchestra. Meet Dr. Marmalade at the Forbes Library. Sing along with The Nields at First Churches. Treat yourself to the Valley Light Opera, making a third First Night appearance with two performances of “Cox and Box,” a one-act comic operetta. Fireworks at 6:15 cap the afternoon and signal the start of the evening entertainment. The City of Northampton treats everyone to a fabulous display that lights up the sky from the roof of the central parking garage. After that, the festivities continue throughout the night. An innovative line-up of bands at the Academy include junk-percussionist, one-man-wonder The Suitcase Junket and Parsonsfield, a five-piece Americana band with an infectious bluegrass-pop sound. Wanna dance? Try some rockabilly stompers with L’il BeeDee & the Doo-Rites at the World War II Club. The Parlor Room celebrates the 30th anniversary of the Valley’s own Lonesome Brothers followed by hometown favorites-- psychedelic folk rockers The Sun Parade. Looking for something more laid back? Take in a little Bach with Archguitar Peter Blanchette at Sweeney Concert Hall, or the revel in the hushed harmonies of Winterpills at Edwards Church. As midnight approaches, it’s time to gather outside the Hotel Northampton for the iconic raising of the ball. For the 31st First Night “count-up,” Deejay Johnny Memphis rides a soul train of classic hits from the ‘60s and ‘70s beginning at 11:30. A single bargain-priced button opens the doors to every event at every venue. Buttons are good all day and evening on December 31. They cost $16 for adults if purchased by December 30. The price goes up to $20 on the day of the event. There are special prices for seniors 65+ ($10) and kids 2-10 ($8). There’s also a $10 Adult Day Only button that’s good until 6 pm. Kids under 2 are free. Buttons may be purchased online (no fees) or at area sales vendors listed at www.firstnightnorthampton.org. The First Night website includes a complete schedule of events and details about each performance. An original drawing by Jane Dyer. Design by Alexis Neubert.